RUGBY League fans need no introduction to the Knights and former NSW Blues captain Kurt Gidley. 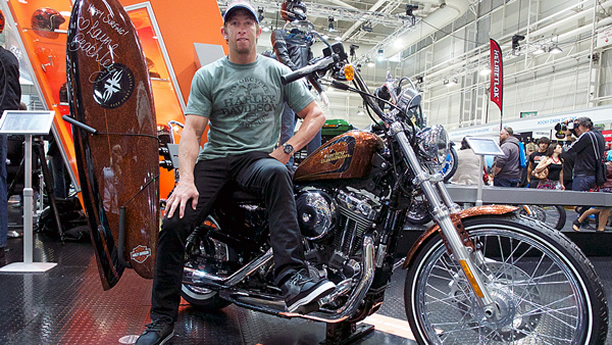 While Gidley’s life pretty much revolves around leading the Newcastle Knights on the field and spending time with his family, there’s the odd occasion where he can get away from it all on his customised Harley–Davidson. We caught up with Kurt at the recent Sydney Motorcycle Expo where he and former NRL and Parramatta star Nathan Hindmarsh were guests of Harley-Davidson, getting the story on where it all started for Kurt and motorcycles. “My mum and dad weren’t too keen on me having a dirt bike when I was a kid due to the safety thing, but I started work when I was 16, and then at 17 I bought my own dirt bike. “I’ve always loved motorcycles and motorsport, especially dirt bikes. I had a dirt bike for a few years and came off breaking my arm. When I was starting to get serious about footy I sold the bike to concentrate on my Rugby League career. And while it’s fun there’s also a serious side to Kurt’s motorcycle riding. “I’m involved with the Old Boars Motorcycle Club, which raises money for Protate Cancer and when I can I like to get involved with fund raising with the club.